Are you contented with the frequent distorted and foggy audio from your front and rear doors? And how can you put up with the weak bass from your subs? Maybe you are thinking about how expensive a full sonic upgrade could be. Luckily, there’s an affordable way of upgrading your car audio system, and that’s using a high-quality 5 channel amplifier. Why use a 5-channel amp? If you have four door speakers and a sub, there’s quite a good chance that you’ll need two amps (maybe a 4-channel and a 1-channel) to drive the system to its optimum performance. Before the introduction of 5-channel amps, car audio lovers would install two amps.Today, 5-channel amps are used to provide the benefits that come with using multiple amps. They save on space, time, and money. We’ve reviewed the best 5 channel amps here to help you make that much needed audio upgrade in your car. Many car audio enthusiasts frequently inquire about how to improve the quality of sound in their car audio systems. According to car audio experts, installing an amplifier is one of the best ways of improving the volume, clarity, and depth of a stereo system. 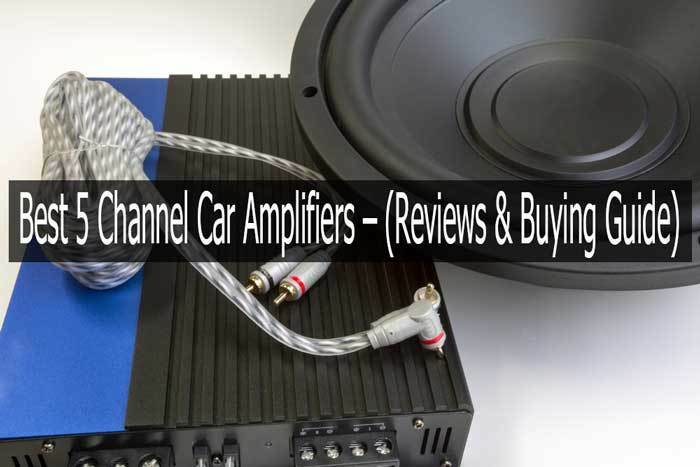 We decided to compile a comprehensive review of the best car amplifiers as part of our response to these questions. The review process kicked off with a brainstorming session aimed at bringing together diverse views of what the best amplifier should include in terms of features and benefits. Our sound engineers, car audio equipment installers, reviewers, and real customers threw in their ideas, which formed the basis for selecting the first list of 5-channel amps. Every amp in this list was tested to verify its performance and other quality indicators. It was quite a rigorous exercise, but we are happy to present to you our well-researched reviews of the top performing 5-channel amps. Pioneer’s GM-D9605 Class D bridgeable amplifier is a sharp-looking, powerful enhancement to your car stereo. Its unique strengths are high efficiency and excellent sound amplification. The amp gives 75 watts RMS to each front and rear speaker and delivers up to 600 watts RMS to the subwoofer. Fills your car with loads of punch: The 2000w MAX rating on this amp gives you an idea of what to expect from your audio system in terms of volume and bass. Look forward to lots of thumping bass and loud sound because that’s what the GM-D9605 is designed to offer. Enjoy first class audio: The amp is designed with highly efficient Class D technology. Class D design enables small-sized amplifiers to produce sound equal to that of bigger amps. It also ensures that the amp runs cool, giving you a pleasurable listening experience always. Simple connection and tuning: Can you still enjoy great sound from your car stereo if it does not have RCA outputs? Pioneer GM-D9605 says you can: it comes with speaker-level inputs for automatic turning on, and high/low-pass filters for adjusting the audio produced to match your preferences. Keeps your sound smooth and your stereo protected: The Total Vibration Control (TVC) and Protection Control System (PCS) are two features that make Pioneer GM-D9605 highly reliable. Any impact of vibration on sound – such as signal distortion - is minimized. And with the PCS, you rest assured that high input power or increased internal temperatures won’t damage your system. Verdict: If a compact, powerful and highly flexible amp is what you view as the best amplifier, Pioneer GM-D9605 won’t disappoint you. Install the GM-D9605 in your car, boat or ATV/UTV and enjoy the uplift it gives your audio. Why ride with weak, boring sound while Planet Audio has brought to the market one of the most favorably priced 5-channel amps? The AC1800.5 packs up to 1800 watts for your system and allows you to customize your sound as you like so that every ride is party time for you. Bridgeable, tri-mode operation – best for powerful subs: The bridging ability of this amplifier is unique. When you set the AC1800.5 into tri-mode, you enable it to bridge two channels into a single channel. Your subwoofer gets more power and hits harder with less distortion. Superior build quality for higher performance and durability: Just looking at this amp’s structure will tell you that it’s designed to win. Nickel-plated contacts, heavy-duty set-screw terminals, and chrome-plated connections enhance its quality build. These are among the main reasons the amp ranked among the best 5 channel amps in 2019. Achieve the best balance between power and audio quality: This amp is designed with Switchable Input Sensitivity that allows you to control the input signal from the receiver. Thus, you’re able to customize the sound to suit your desired listening needs. Enjoy your favorite tunes knowing your system is fully protected: Planet Audio takes system protection to a higher level using a 3-way System Protection circuitry. Your stereo components are under full thermal, current overload, and short-circuit protection. The heavy-duty aluminum heatsink also prevents thermal breakdown by dissipating heat efficiently. Our view: Do you need to drastically improve the volume and overall quality of sound in your car? Planet Audio will give you that quick inexpensive sonic upgrade you are looking for. Take this great chance: Get Planet Audio AC1800.5 Anarchy at its current pocket-friendly price. Everything about BOSS Audio is captivating. Getting impressed is the only option with this amp. Its 3700w MAX power catches your attention, whereas the multi-LED backlight illumination inevitably fixes your eyes on it, and its power and flexibility inevitably raises your love for quality sound. Massive power output: If you have been wondering where to find an amp that can work seamlessly with your big subs for audiophile-level kind of bass, Boss Audio PV3700 might be what you have been missing. You know what 3700 watts peak power capability can do. Class A/B topology and MOSFET power supply: Boss Audio PV3700 is where high energy efficiency, flexibility, and quality sound production meet. The A/B linear circuitry increases the quality and output of audio and minimizes distortion. The MOSFET power supply improves efficiency and minimizes heat production. 2-ohm stability and bridgeable: Being a 2-ohm and stable amp, it’s able to power your speakers and subs comfortably so that the system delivers louder and more powerful sound. When bridged, the amp provides a substantial increase in power output for production of more bass. Build a high-power audio system from any source unit: The amplifier has both high and low-level inputs which provide a great deal of flexibility. Whether you have a factory or aftermarket source unit, you can easily control the frequency passing through your full range speakers and subwoofer. Amplifier is well protected against temperature and voltage upsurge: When you have a high power system, you want to know that its protection properties are reliable. The PV3700 has a protection circuitry that constantly monitors the thermal and voltage conditions of the system to ensure that it’s not damaged due to overheating or current upsurge. Our say: Boss Audio PV3700 makes it to the top 5 amps in our review because of its exceptional power abilities, flexibility, and favorable price. It is probably the quickest and most inexpensive stereo upgrade for an audiophile. Customize your beats for total amusement from your music byhaving the PV3700 amp installed today. It runs your entire system comfortably: Rockford Fosgate R600X5 is the perfect all-in-one solution for your amplification needs. It runs your 4 speakers and subwoofer without tiring and can also be bridged to run at 2-ohm. Its speaker-level inputs make it work with any stereo, including factory systems. Unmatched sound quality and listening experience: We have experienced Class A/B and Class D amplifiers but never known how impressive the combination of all the three classes (A, B, and D) feels like. The R600X5 gives you the best of all worlds: Class A’s excellent sound quality, Class B’s minimized overheating, and Class D’s high level of efficiency. Consistently loud and undistorted audio: This amp doesn’t struggle to blow you out of the car, but it consistently fills your car with extremely clean, satisfactory, and loud sound. It does this by sending 50 watts to each regular speaker and 300 watts to the sub . Easily turn the boom up while driving: You can use the Punch EQ adjustable bass boost to push your system to produce deeper bass from the comfort of your driving seat. Remember the amp has the ability to send car shaking bass kicks with its 700 w of peak power. Thus, make good use of the bass boost remote control. Our say: Rockford Fosgate has really tried to use its proprietary design to make sure this amp delivers superior sound quality. With this CEA-2006 compliant amplifier, you know you have a dependable upgrade for your car stereo. Order Rockford Fosgate R600X5 Prime for long-term, high-efficiency sound amplification. JL Audio has continued to awe car audio enthusiasts with great equipment. The brand is currently featured in almost all reviews of top speakers and amplifiers. We investigated JL Audio XD700/5V2 and here are the amazing features our review managed to confirm. Small amp but packs massive power for your entire system: The XD700/5V2 surprised us with its power output – it delivers 75 watts RMS to your 4 (front and rear) speakers and up to 300 watts to your sub. Highly versatile to suit a wide range of systems: We’ve already seen that the amp can be used with a 5-channel system. What if you use active speakers or a 3-way speaker system? You can high-pass the front channels of the amp to run tweeters, band-pass rear channels for greater mid-bass output, and low-pass the sub channel for deeper bass. Unsurpassed efficiency and audio quality: Thanks to the NexD technology used on the XD700/5V2, your system is upgraded to produce exceptional audio quality with total energy efficiency. It plays your music with absolute fidelity, allowing you to enjoy an ever-pleasant listening experience. Advanced Rollback Protection (ARP): To eliminate those frustrating abrupt amp shut-downs caused by overheating, the XD500/V2 uses JL Audio’s exclusive protection circuit (ARP) to monitor the amp’s thermal condition and make adjustments when needed. Verdict: Clearly, JL Audio XD700/5V2 has specs only found in the best multichannel amplifiers. There’s a reason for its high price, but those who have experience with car audio equipment know that it’s worth paying a bit more for quality. If your budget can allow, don’t hesitate to order the XD700/5V2. First things first; Polk Audio PAD5000.5 runs as cool as any amp can ever run for as long as you want it. This ultra-efficient Class D amp will make you miss being behind the wheel since its power gives your stereo the ability to produce music full of purity and clarity. The PAD5000.5 may look small but you are well enlightened not to be fooled by thesize. This pretty amplifier continuously sends a whole 70 watts to each of the front and rear speakers and 500 watts to a sub. As you can see, it’s a sound amplification beast packed in a small chassis. Crystal clear sound: Your longing for clean, distortion-free sound ends here with Polk’s Class D technology and adjustable high- and low-pass filters. While the Class D design facilitates the reproduction of cleaner and more articulate audio, the two adjustable filters enable you to keep highs away from lows to make the overall sound flawless. Ultra-high energy efficiency: The amp uses the popular MOSFET power supply that ensures energy is used efficiently during sound reproduction. Energy efficiency also means less production of heat. The amp thus runs very cool despite its very high power capabilities. Strong structure and stainless exterior: To ensure that your compact amp serves you for years to come, Polk Audio uses a coated PB board to make the PAD5000.5. The construction also features many stainless steel parts that don’t corrode easily even in harsh and humid environments. Our view: The PAD5000.5 is among Polk Audio’s most energy-efficient digital amplifiers. You will pay a premium price for it, but what you get in return is something any other amplifier of this size would struggle to deliver. Arm your car audio system with the right amount of power and you’ll always be blown away by the music it gives you. You’ll rarely find a 5 channel amp that powers your entire audio system the way Kenwood KAC-M8005 does. If you have a set of high-performance speakers and a sub, this amp is more than enough to drive them crazy with power and drive your moods up with exceptional sound quality. Small amp but high power capabilities: The KAC-M8005 is probably the smallest 5-channel amp you have ever come across. But in its compactness lies an unfailing ability to run four full-range speakers with 50 watts RMS each and a subwoofer with 500 watts RMS. Weather-resistant music on the go: Kenwood KAC-M8005 is suitable for marine applications and power sports, thanks to its conformal-coated circuit board. This board protects inner circuits from moisture, dirt, and water. Itmakes sure the show goes on regardless of the weather conditions. Gives you the best tone for your music: Technology has given the modern sound enthusiast control over almost all aspects of entertainment on the go. The KAC-M8005 is designed with high- and low-pass filters that help you to tailor-make the sound output from your speakers and subs. The KAC-M8005 accepts input signals from any source - You can connect RCA cables or speaker wires from your receiver to the amp. It uses the speaker-level inputs to sense the signal for an auto turn-on (it turns itself on). This negates the need to turn on the lead on the receiver. Verdict: This CEA-2006 compliant amplifier a great pick. It comes from a leading brand, and it’s compact enough to fit in small spaces. Moreover, it’s powerful enough to run your entire car audio system. Are you looking for an amplifier with specs that bring on board serious sound amplification? Try Skar Audio RP-600.5, a Class AB/D full-range amp that uses a high-speed MOSFET power supply to run your system and a 4-way protection circuitry for ultimate protection. Bridgeable, Class AB/D amplifier properties: The RP-600.5 is the biggest rival of Rockford Fosgate R600X5 when amplifier topology is considered. Class AB/D technology makes the amp extremely energy efficient while still producing loud, non-distorted sound with minimal heat production. The RP-600.5 can also be bridged to feed more power to your sub. Unmatched stereo protection: The majority of amplifiers have thermal, voltage, and speaker protection. Skar Audio RP-600.5 has a 4-way protection circuitry that offers DC protection in addition to other protection properties. This is the kind ofan amp that allows you to turn the music and bass up to the max without any worries of breakdown. Exquisite high and low frequencies: With the high- and low-pass filters and bass boost controls, Scar Audio RP-600.5 gives you the freedom to fine-tune your sound according to your preferences. That’s why it is so easy to get high-quality sound (crisp and precise highs and deep, articulate bass) from a system powered by this amp. Excellent heat dissipation: At the core of every high-quality amplifier’s chassis is a solid heat sink. Scar Audio uses a cast aluminum heat sink for heat dissipation. It aidsin faster drawing of heat out of the system so that your system remains cool even when performing at its highest power level. Skar Audio has used the best gauge wire for this amp. A 4-gauge wire is the most suitable wire size for a system with 700 watts RMS power capability. This wire is able to handle the input power and grounding requirements of the RP-600.5. Verdict: If you are tired of the weak audio from your system and want an upgrade with a limited budget, consider Skar Audio RP-600.5. It is highly efficient and has premium features for stereo protection. View current price of Skar Audio on Amazon. Alpine PDR-V75 showcases great improvement on the basic Class D amp design. Real users’ sentiments portray it as one of the best sounding and most compact 5-channel amps. You get high-quality sound from a small, lightweight amp that can fit well under the driver’s seat or in the dash. Your music keeps pumping even when overheating conditions are detected: The fact that every amp faces overheating challenges is not news. But while a typical amp will shut off momentarily when there is overheating, the PDR-V75 uses a more advanced inbuilt thermal management system that reduces (rather than shut off) output power when it detects overheating. Extra bass fun: In addition to Alpine’s standard adjustable high/low pass crossovers and bass boost, the PDR-V75 gives you the option of using a separate remote bass level control. This allows you to get even more bass from the system for a better listening experience. Exquisite high and low frequencies: With the high- and low-pass filters and bass boost controls, Scar Audio RP-600.5 gives you the freedom to fine-tune your sound according to your preferences. That’s why it is so easy to get high quality from a system powered by this amp. Excellent heat dissipation: At the core of every high-quality amplifier’s chassis is a solid heat sink. Scar Audio uses a cast aluminum heat sink for heat dissipation. It aids faster drawing of heat out of the system so that your system remains cool even when performing at its highest power levels. Powerful sound reproduction at 4-ohm, 2-ohm, and bridged mode: This Class D amp can run 5 channelssimultaneously as follows: i) 75w per channel for 4 channels + 250w for 1 channel (sub) – 4-ohm. ii) 100w per channel for 4 channels + 350w for 1 channel – 2-ohm. It can also function as a 3-channel amp when bridged. Removable wire terminals make the amp very easy to install. Even if you’ve never installed an amplifier before, you can quickly set up Alpine PDR-V75. The wire terminals can be plugged and unplugged once they are attached to your speaker wiring. Our thoughts: Alpine PDR-V75 is currently on high demand because of its high power performance and unique thermal management system. And it is, of course, one of the most compact multichannel amps on the market. Get this superb performer today for a complete transformation of your audio system. So, you know of a number of top performing 5-channel amps. But you still have to close in on one amplifier that best matches your listening needs. Maybe you want to get rid of the boring distortion you experience from your car stereo or the system’s inability to crank up your favorite jams. We’ll discuss the most important factors to consider as you aim to give your audio system the best upgrade. 1. Does the amp meet your system’s power requirements? You need an amp that will make your system sound better. Volume and bass are definitely top on the list of required improvements. But your speakers and subs have specific power ratings (RMS and MAX power indications). These ratings should guide you when choosing the best amp for the system. One important thing to remember is that you’d rather overpower than underpower your speakers and subs. Underpowering speakers often damages them.As such, consider amplifiers that have an RMS rating higher than that of your speakers and subs. 2. Is the amplifier bridgeable or not? While it’s obvious that 5-channel amps are designed mainly for 5-channel systems, it doesn’t necessarily mean that the same amp cannot be used with a 3-way system. The only requirement is that it is bridgeable. Most of the amps reviewed above are bridgeable and we did that intentionally. If you’d like to change the composition of your car audio system in future – for instance to add more speakers – you’d better buy a bridgeable amp today because it offers more flexibility. 3. What is your main reason for buying a car amplifier? There are many sound ills that 5 channel amplifiers treat. What is the most disturbing problem affecting your car’s sound system? Is it distortion? Amps with more linearity (such as Class A/B amps) are considered more suitable for producing distortion-free sound. Do you want more sound volume from a low powered system? You can use a highly-efficient amplifier to achieve superior sound reproduction. Class D amps are reputed with high energy efficiency and are therefore great for this purpose. You want more bass from your subs: Subs are wonderful components to have in your car but they feed heavily. Coupling them with a high power amp is the only way to push them to their optimum potential. Every amplifier has an ohms rating, which describes its impedance - how hard it has to work to drive power through. The lower the impedance, the easier it is for the amp; and the higher it is, the harder the amp has to work. Most 5 channel amplifiers have a rating of 4 or 2 ohms, but always check to ensure you get the right one for your audio system. The following qualities make an amplifier more desirable to real users. Check them out. Thermal, voltage, and short protection – especially crucial for amps with high power capabilities. Adjustable equalizer – gives you more control over your system and ability to tweak your music to your liking. Subwoofer remote control – gives you control over your sub from the driver’s seat. Lastly, don’t forget to consider the size of the amplifier to ensure that it fits in your vehicle. Technology has made it possible to design extremely compact amps. You can get an amp as thin as a textbook and as long as your palm. Make sure you check the installation space requirements before buying your new amp. Pioneer GM-D9605 showed unique strength especially in power output and energy efficiency. It can run your system continuously, giving each of the front and rear speakers enough power to produce excellent high and mid frequencies. For your sub, the amplifier packs up to 600 watts RMS so you can be sure to receive some explosive kicks and incredible sound volume. Being a Class D amp, the GM-D9605 exhibits exceptional energy efficiency, meaning it will give your audio system more power than it currently gets. Another feature that puts this amp ahead of the competition is its Total Vibration Control technology. We could not get enough of the smooth, clean sound this amp produced thanks to its superior vibration minimizing abilities. And you don’t have to break the bank for this excellent performance. Pioneer has placed an average price tag on the GM-D9605.